now imagine having been that soldier in both campaigns." I’ve sometimes found war novels a bit boring because they are lacking in plot—there’s no real drama among the characters in terms of relationships like civilians have, and that is understandable, for they are dropped into a war zone and all the conflict and concentration is geared toward fighting and defeating the enemy — there’s little space for romance, petty jealousies, and other personal dramas, etc. But Meyer makes the characters come alive, depicting friendships among the soldiers, bringing in racial issues between the white Sam Kensington and his black friend and fellow grunt, Wilson, as well as the issues of rank in the army among the various soldiers and their officers. There is no sentimentality here, but it’s clear through the dialogue Meyer writes that these soldiers care about each other, that they are frightened, that they have hope, and that often, more is left unsaid than is said. In the end, I feel like The American War is a real testament not only to our soldiers and what they endure, but also a testament to the American soldier and especially families who have served our country through the military for generation after generation. Whatever else I might say will only fall short in trying to understand or explain what it must take to write a novel like this. As a historical fiction writer myself, I can only appreciate the effort, personal feeling, and research Meyer obviously put into it, and I’m sure it was cathartic for him. It should be noted that Meyer is also the author of a Vietnam War memoir, The Protected Will Never Know. I think that title says it all. We can’t know, but we can try to understand what the Vietnam War was for the people who fought in it by reading such novels, and we can be grateful for the sacrifices made. Sadly, Meyer’s main character Kensington never really comes to understand what it all means — fighting such a war — and he concludes, "But it don’t mean nothing." Writing such a novel has to be difficult as an effort to find meaning in something that can’t easily fit into a neat definition or meaning, but that Meyer is able to accept that, rather than hold onto some false meaning, makes The American War all the better and more realistic and true despite the fanciful aspects of it, which in the end, only confirm that understanding — or lack of one. Don Meyer captures the realities, the nuances, and the futility of war as well as the strategy and nightmare of battle in "The American War." The story parallels the details of the 101st Airborne’s return to the Shau Valley in South Vietnam in the summer of 1969 and the march into the Shenandoah Valley in Virginia by General Ricketts and his men of the Third Division in the summer of 1864. These battles both are said to have marked the turning point in each war. Meyers skillfully describes the daily life-threatening struggles faced by fatigued, battle weary troops. Engaging dialog between Sam Kensington, his buddy Harold (Big Stick) Wilson and his XO Lieutenant Orville Smith move a complex plot forward. Although distracted by repeated descriptive actions and overuse of profanity common in military jargon, I am impressed with Meyer’s writing style combining a creative imagination and gift for storytelling. These are strengthened by Meyer’s own background as a Vietnam veteran. Sam Kensington’s vivid dreams of precise incidents from the battle of Shenandoah Valley are related to his XO Lieutenant Orville Smith who has a fervent interest in the history of the Civil War. The dreams are so real that Kensington becomes fixated on determining an underlying cause. Don Meyer brilliantly writes of the frustrations and terrors of the conflict experienced in the front lines of battle. The Civil War segments are well researched. "The American War" is a story that will be acclaimed by fans of military history, Civil War buffs, and especially by Vietnam veterans. In this unusual Vietnam War story, Sam Kensington, an average G.I., along with his buddy Wilson, are veterans of numerous patrols and closely attuned to each other and to their surroundings. Their outfit, a platoon of the 101st Airborne, is ordered to join an offensive to take back the A Shau Valley because it is a direct supply route for the Viet Cong to their troops. Just prior to beginning the action, Sam has startlingly realistic dreams that simultaneously he is fighting in the Civil War campaign to take the Shenandoah Valley in Virginia. These dreams continue and are an enigma to Sam, his friend, and even the XO, who is a Civil War buff. Sam consults him, and the answer is only revealed at the end of the book. The verbalization and references are those employed by troops in the field during that conflict, the settings believable, and the book is well-written and moves along reasonably well. However, although, and perhaps because of the similarity of patrol activity in the existing terrain, further editing might have reduced some of the repetition of similar details to produce a more compact package. In the summer of 1969 elements of the 101st Airborne went back to the A. Shau Valley in South Vietnam. In the summer of 1864 the 10th Vermont, part of General Ricketts' Third Division, marched into the Shenandoah Valley in Virginia. Sam Kensington was there at both campaigns. OK, you got my attention. I would say 75% of the review requests I receive are fantasy, horror or mystery based. It seems to be the go-to genres for independent authors. Unfortunately, though, these are not my go-to genres. But I do enjoy a good history-based story so I agreed to review The American War by Don Meyer. Mostly I wanted to see how Meyer would pull this story off and make it believable - how a soldier could be in both wars, 100 years apart. I included the above author's blurb solely for the fact that he could do a much better job summarizing his novel than it turns out I can. Sadly, I did not finish the book. As much as I tried to, I could not engage in the story. I don't particularly like modern day wartime books or movies, especially those based on the Vietnam War. Perhaps they are just too grim and depressing for my tastes. If the majority of the story had actually taken place in the Civil War era, I may have found the book more enjoyable. However, it appears the lead character, the above Sam Kensington, is firmly rooted in the Vietnam War era and only dreaming that he is in the Civil War. And the two events are somehow connected via a gun. So Meyer only gives us glimpses and snapshots of the Civil War. Pity, because I lost interest fast. It's clear Meyer did his research on both wars - perhaps, I suspect, might have even been in the Vietnam War himself and even at the particular campaign featured in the book. He has a near encyclopedic knowledge of the everyday life, mannerisms and language of the American soldier in the Vietnam War. And he handles the colloquial switch well between the two eras. He isn't using the same voice for the two different time periods. His voice changes according to the timeperiod and I find that to be the mark of an above average writer. Still, however, I could not bring myself to finish the book. I have many, many books on my library's to-read shelf - both of my own choosing and those I am obligated to review for authors and publishers. I don't have time to slog through a book that isn't catching my fancy. And if you, dear reader, are anything like me, it takes me ten times longer to read a book I'm not enjoying than one I am loving. It's harder to pick the book up and it's harder to stay focused on it. 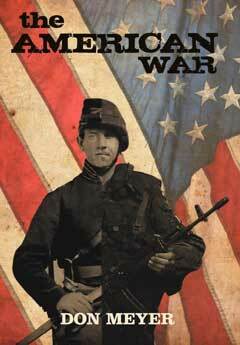 I am giving The American War two bows - not because it isn't well written but because it just wasn't my cup of tea. I believe I will pass it on to someone who finds war novels more enjoyable than I. Is it possible to fight two wars at the same time? In the summer of 1969, elements of the 101st Airborne went back to the A Shau Valley in South Vietnam. In the summer of 1864 the 10th Vermont, part of General Ricketts' Third Division, marched into the Shenandoah Valley in Virginia. Sam Kensington was there at both campaigns. How on earth can this be possible? I ask myself the same question, and it was only when I read the book that I found the answer. You too can find the answer when you read Don Meyer's book, "The American War". War is always a topic we want to find out about, though it is usually not anything good to hear. I think that is why it took me a while to really get interested in this book, but after a while, I was so captured by this well-written story that I couldn't put the book down. Sam Kensington is the main character, and I won't go into details about him, because it will ruin the book for you. Sam, otherwise known as Four Seven, was a unique, well-respected soldier in both wars. Don Meyer creates a cast of believable and realistic characters, setting them in a story that is so intense and real that it makes the reader feel as if he is right there in battle with the characters. The way Meyer writes the battlefield scenes gives readers an actual account of what it is like to be there fighting. It all just seem so real when we read it! If you like war stories, this is definitely a book for you to read. Or if you are like me and you are curious as to what the battlefield is like, then also you will enjoy this book. Be advised that this is a book written by a man, with men at war, so you can imagine for yourself the language and men talk in the book. Go grab a copy of this well-written book by author Don Meyer to read for your own enjoyment. The soldier is always fighting, always facing death. "The American War" follows the curious case of Sam Kensington, a soldier between eras. Focusing on two major campaigns a hundred years apart in the American Civil War and the campaign in Vietnam, following two battles in these wars and the impact of facing both of these conflicts. "The American War" is a unique take on the endeavor of war, very much recommended. Posted June 8, 2012 by The Midwest Book Review, James A. Cox, Editor-in-Chief. Just finished The American War! Great book - you definitely have talent and skills as a writer - Tom Clancy better beware! Really enjoyed the way you related the two campaigns and overlapped the actions in each war - a history lesson for part of the book and, for those of us who were there, a re-living of the other part of the tale. Certainly a different war, but with interesting similarities and striking dissilimilarities. Interesting that I completed the book on Memorial Day - and very fitting. The back jacket of Don Meyer's new book says, "In the summer of 1969, elements of the 101st Airborne went back to the A Shau Valley in South Vietnam. In the summer of 1864 the 10th Vermont, part of General Rickett's Third Division, marched into the Shenandoah Valley in Virginia. Sam Kensington was there at both campaigns." As a military history buff and veteran (US Navy) I found this description fascinating, and so I asked Don Meyer to send me a copy of his book. I'm glad he did. The book starts with a chapter laying out the fall of the A Shau Special Forces camp in 1966. It then moves into the preparations for the Union invasion of the Shenandoah Valley in 1864. We soon learn that the extremely detailed accounting we're getting of the 10th Vermont's preparations are the dreams of one Sam Kensington, grunt, waiting to move into the A Shau Valley. Sam is no Civil War buff, and he has no idea why he's dreaming about this war, or even what campaign of the war he's seeing. Since he's seen action before in Vietnam without these dreams, he's a bit concerned that he's cracking up, and ends up talking to the Company XO, who happens to know a bit about the Civil War. The book then proceeds in parallel, with us following both Sams, first in Vietnam, then Virginia, then back again. Meyer, the author, is a Vietnam vet, and so his Vietnam scenes are more realized then the Civil War scenes, but both eras are portrayed in a griping and compelling manner. Sam in both wars is just a grunt, so his war isn't the big sweeping arrows on a map, but rather the personal war of keeping himself and his buddies alive, while maybe getting lucky enough to score a hot shower and hot food. I really enjoyed reading The American War. Having said that, sometimes self-publishers could really use a story editor and this is one of those times. We find out way at the end of the story, in a section that feels a bit bolted on, why exactly Sam is having his dreams. Without giving away too much, it's the reverse of Checkov's Gun, in that the ending is not foreshadowed. The heck of it is, it would have been a matter of a paragraph or two to adequately foreshadow (or at least support) Meyer's ending. Despite that flaw, I can wholeheartedly recommend The American War to any buff of military history or historical fiction.